Music is a subject that should be part of every homeschool day in one way or another. Many times I think that we forget that a homeschool music class doesn’t have to be private music lessons. 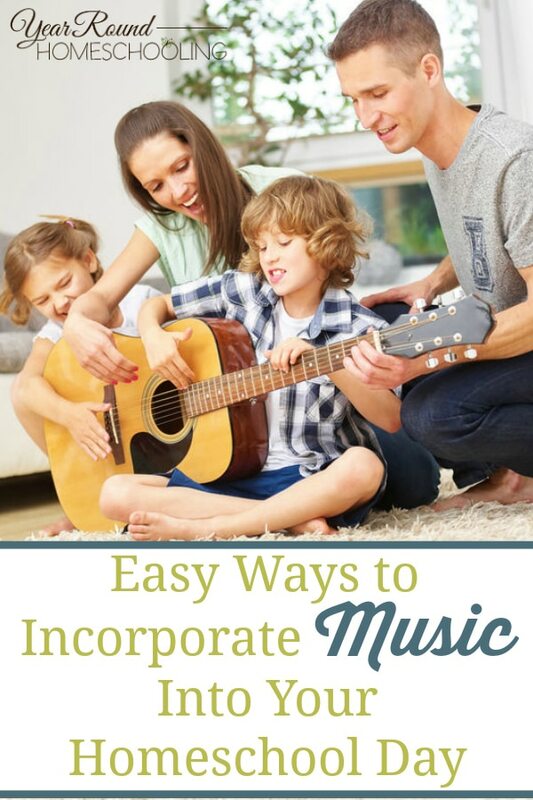 There are so many fun and easy ways to incorporate music into your homeschool day. Especially if you can think outside the box! I truly believe that music is the voice of the soul, which means if we as parents pay attention to the music our children are drawn towards we will learn things about them they might never have told us. This can provide great opportunities for conversation with our children, but only if we’ll take the time to listen to the music our children enjoy. Are you ready to get started? I’ve put together a list of easy, out of the box ways that you can add music to your homeschool day! 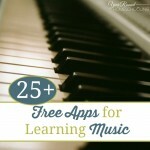 Don’t let this list limit you, instead let it be a springboard to discovering more opportunities for your homeschool music class! When my children were young I often played Classical Music in the background throughout our homeschool day. Now that they are teenagers, they have their own playlists that they listen to during some of their homeschool studies. My kids love to play ‘Name that Tune’. This is one of their favorite evening activities. They pull out their laptop and play songs from YouTube and everyone has to guess what the song is. You could also play, ‘Name the Artist’, ‘Name the Composer’ or ‘Fill in the Lyrics’. Studying a composer will often give you insight into their music as you learn about their life. As a result, you’ll understand their music genre of choice, sense the emotions from their life in their music and much more. Whether you’re looking for frugal printable games like this music notes and symbols set or educational music games to play with the family, you’re sure to have fun! Children that love to read will enjoy learning about music through literature. It will be an easy way for them to cover music in any homeschool day. For reluctant readers, you could make it part of your homeschool read aloud time. Biographies of famous composers, singers and musicians, books covering music history and genres – the options for music themed literature abound! While I do not believe that video games should be part of every homeschool day, however there are quite a few fun music themed video games that you can use. For example, Just Dance could double as a music activity and PE! Music show ‘n’ tell is a great way to encourage children that are taking private music lessons to share what they’re learning with others. Make it an evening affair for the family to enjoy or an after lunch activity to break up other studies. Little ones love this game and it is such a fun, simple way to incorporate music into your homeschool day and it helps get the wiggles out! Try changing things up by using different music genres to introduce your little learners to new music. 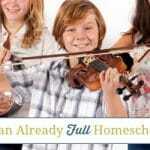 What is your favorite easy way to incorporate music into your homeschool day?